By Daniel Horowitz--More than 300 enthusiastic members of Toronto’s Jewish community made their way downtown on Thursday, March 1st to The Kool Haus, for an evening of celebrity schmoozing, great food and drinks, and a smashing ping-pong tournament. 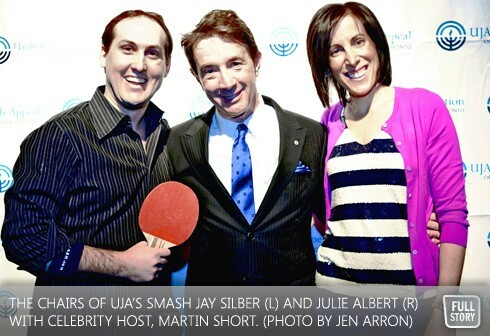 SMASH, United Jewish appeal of Greater Toronto’s first celebrity ping pong tournament, created to raise funds to help send underprivileged Jewish youngsters to Jewish summer camps, was, well, a smashing success. Chaired by Julie Albert and Jay Silber, SMASH was hosted by Canadian icon Martin Short. “What could be a better goal than to help send kids to summer camp,” said Short, explaining why he chose to get involved. Short said that his own time spent at summer camp in the Kawarthas was extremely important. Studies have shown that attending Jewish summer camps, or Jewish day camps, result in an increased Jewish identity and connection to Israel, not to mention the lifelong friendships that are formed between campers. Through United Jewish Appeal’s Camping Subsidy Program, and made possible by UJA’s partner agencies Jewish Family & Child (JF&CS) and JIAS, Jewish children from low-income families will receive scholarships to attend Jewish summer camp, guaranteeing them a summer that they’ll never forget! Other celebrities on hand to rally with the crowd were singer Chantal Kreviazuk, Carla Collins, Ellen Dubin, former Maple Leaf greats Gary Leeman and Wendell Clark, Raptor Amir Johnson, John Salley, Kiowa Gordon, and actor William Baldwin.